Help us to enrich and empower the future leaders of tomorrow with the critical skills needed to create a successful life built on key principles. We are passionate about investing in the lives of the next generation and we know we are on the verge of something great. You have an opportunity to help change lives and be a part of a movement committed to developing successful youth. We know that education is the key to unlock multiple doors. Help us to change the life of a child by donating today. Your financial support allows us to continue to fulfill its mission of providing an exceptional educational experience. Interested in being involved in the strategic direction of E3? We are seeking Advisory Board members who can help steer and pivot E3PLA in becoming a premier education academy. 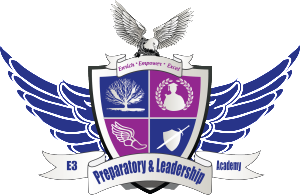 E3 Preparatory and Leadership Academy is a 501(c)(3) organization and we welcome your financial support. Gifts are tax deductible to the extent allowed by law. You may make a gift via credit card either by contacting the organization or by using the PayPal donate button. Checks should be made payable to: E3 Preparatory and Leadership Academy. You may make a gift via credit card either by using the Secure On-Line Giving form. Cash – The simplest and most common gift is a gift of cash. For income tax purposes, a cash gift is deductible to the extent allowed by law. Tangible Personal Property – A donor may contribute personal property such as jewelry, art work, boats, motor vehicles, etc. In general, you may receive a tax deduction for the fair market value of the item donated as determined by an appraisal. Bequests – Donors may include E3 Preparatory and Leadership Academy in their estate plans. Some bequests may result in estate tax benefits. Insurance – By naming E3 Preparatory and Leadership Academy as beneficiary and/or owner of a life insurance policy you may achieve tax advantages without compromising the primary obligation of protecting loved ones. Stock Options – An excellent vehicle for the corporate executive. Gifts to E3 Preparatory and Leadership Academy can be unrestricted or restricted. Unrestricted gifts are spent where the school believes the need is greatest. Restricted gifts are spent only for a specific purpose designated by the donor.